Blend your morning cup of joe and night time craft brew with this coffee featuring notes of hops and barley. You may have had the brilliant idea to combine your two favorite drinks: coffee and beer. But unlike Sean Godbey, you probably don't have your own spice and coffee shop to test the theory. Innovative brewmasters craft stouts, porters, and IPAs with coffee infusions, but never the other way around. So, Sean blended favorite beer ingredients like barley and hops with coffee grounds and the rest is history. Brew a cup of this unique combination to satisfy your curious, craft-loving tastebuds. Handcrafted in Fort Collins, Colorado. In 1985, the Godbey family moved to Northern Colorado, where they fell in love with the mountains, plains, and people. The area, says Sean, “has always had many good restaurants, but what was missing was a place where people could buy fresh spices and blends tailored to the Colorado way of life.” So he and his family built one. Now a staple for food lovers across Northern Colorado—and worldwide thanks to Internet magic—Sean invites everyone to taste the difference that fresh spices, blends, seasoning, and other products can make in your life. For a french press, brew 2 tbsp per 8 oz cup. For drip coffee, brewing a half pot is suggested for best flavor profile. Recipent of gift loved it! I make and drink a lot of coffee. I tried this coffee both in a drip machine and french press with similar results. The aroma is great right from opening the bag. However, the taste was rather bland. I expected a stronger and bolder taste. While not a new "every day" coffee for us, it was very interesting to try - and it was a great gift for the enthusiastic home brewer in our house! We thought it might have been a happy accident in a brewer trying to make a caffeinated beer! Definitely needs to be brewed more strongly than straight coffee. This was a gift; my Son-in-Law loves it! The smell of beer in coffee in the mornings makes it much easier to get out of bed! Perfect gift for any beer/coffee lover!!! My boyfriend drinks this on the weekends and absolutely loves it! 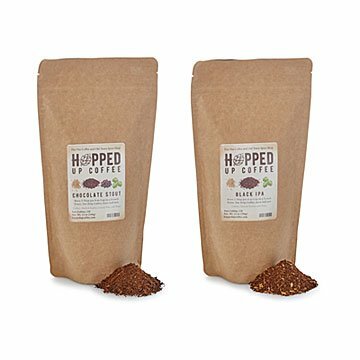 I always give my husband a bag of unique coffee in his Christmas stocking. These are a type I've not given before. Should be fun!